Rickles is an American smasher from Illinois who mains Ganondorf in both Super Smash Bros. for Wii U and Super Smash Bros. Ultimate. He is a widely respected tournament organizer and founder of Hitpoint Tournaments, as well as being a commentator at both local events and some majors. Rickles is also a very skilled player, considered to be one of the best Ganondorf mains in the world in Smash 4, with wins over players such as tyroy, PowPow, Comet, Vash, Sells, K0rean, and Tremendo Dude. Most impressively, he won the award for highest placing Ganondorf at Hyrule Saga, defeating Razo and K9sbruce to finish at 49th place out of 780 entrants. He has also won The Arcadian 3 in Michigan using solo Ganondorf. His Smash prowess carries over to doubles, which he frequently places well in. In Ultimate, Rickles continues to main Ganondorf. 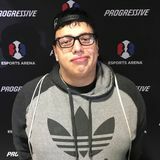 He is currently ranked 8th on the Chicago Power Rankings. This page was last edited on April 3, 2019, at 20:35.